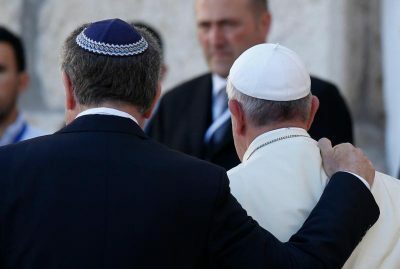 VATICAN CITY (CNS) — A few decades of respectful Catholic-Jewish dialogue pale in comparison to “19 centuries of Christian anti-Judaism,” Pope Francis said, so Catholics must continue to ask forgiveness and forge new bonds of respect and friendship with the Jewish community. Pope Francis said the volume of commentaries, “The Bible of Friendship,” is an important tool for helping Catholics recognize the Jewish roots of their faith and for promoting concrete Catholic-Jewish cooperation in helping others. “The values, traditions and great ideas that characterize Judaism and Christianity must be placed at the service of humanity without ever forgetting the sacredness and authenticity of friendship,” he said.